We recently reported on the announcement of Firmcoin, a reprogrammable physical bitcoin token. This can be thought of as an option between Bitbills or Casascius coins and the Trezor hardware wallet. The amount that it carries is not fixed, but it’s cheap enough to be exchanged as a physical token. We spoke to the man behind Firmcoin, Sergio Lerner to find out more. Q. What is your background and training in? SL: I was an assistant teacher in Cryptography at University of Buenos Aires. I have a Masters in Computer Science, and my thesis was on advances in Cryptography in Mental Poker protocols. I hold four patents on cryptographic apparatus and methods. I worked more than fifteen years in computer security and code breaking, both for the private sector and for the Argentinian government. I write about crypto in my blog (bitslog.wordpress.com). I received two awards in computer security contests hosted by CORE Security Technologies. I received two medals and four awards in international algorithm competitions (IOI/ACM). Nevertheless, since I’m human I can make mistakes and that’s why all Firmcoin protocols/code will be open for anyone to review. Q. For first-time readers, would you please give a layperson explanation of what Firmcoin is? SL: Firmcoins are the evolution of banknotes. For all that matters to common people, they have the same properties as paper money. The idea is that you will use a Firmcoin in any context where you would prefer using a banknote over a credit card. To pay for an item, you give the Firmcoins. The main difference between paying with a Firmcoin and paying with your smartphone using a wallet application is that Firmcoin transactions are offline. You don’t need an Internet connection, and it’s even possible to accept Firmcoins with confidence without having a computer. They are anonymous, as much as banknotes can be (the banknote serial number could be used to track them, but there’s not much an attacker can learn). Both banknotes and Firmcoins have security measures to prove their authenticity. In a banknote, you have physical countermeasures to prevent counterfeiting. Firmcoins have both physical and logical measures to prevent counterfeiting. You can transfer coins from the Firmcoin to your bitcoin wallet back and forth without going to a bank or a trader. That makes them the most private bitcoin transfer system ever made. – Unlike bank notes that hold bacteria, Firmcoins are nice-looking, crystal clear, 100% cleanable, geeky devices you will love to hold. – There are two versions of Firmcoins: one holds only a fixed amount of bitcoin and the other can hold variable amounts of money, showing the amount in a nice e-paper display. – The issuer of the Firmcoins need not be a bank, or a money transmitter, nor is it currently regulated in any other way (as far as I know). – A Firmcoin can hold certifications of authenticity created from other entities, to increase even more the confidence in the device. Q. How does this differ from the other physical representations of bitcoin? SL: Most of the answers can be found on the Why? page on the Firmcoin website. However, Bitbills may be cheaper, but they are for one-time use, so you have to add the cost of wasted notes. Also, Bitbills are sold holding some BTC (they cannot be loaded by the buyer), so the Bitbill issuer may be regarded by governments as money transmitters/issuers, so they may try to regulate them, which would be overkill for the Bitbill cost. Q. Why do you think there is a need for physical bitcoins? SL: First, people love nice-looking physical objects. The first day I uploaded the Firmcoin.com webpage, people started asking me to sell them Firmcoins to give as gifts. – You may be too drunk to operate a hardware wallet properly! – If you’re in a dangerous place you may not want to have a smartphone with you that can be used (by extortion) to steal all your money in your account. – You may be in Argentina, where merchants often cannot process credit cards or any electronic payment system because the network is down. – You may be in the middle of the desert without a cellphone signal. – You may want to give bitcoins to a friend that does not have a bitcoin account, nor understand how to use a bitcoin wallet application. – You may want to buy something completely anonymously. Q. Since Firmcoins are reprogrammable, could they be used for altcurrencies? SL: Yes, they are designed to hold any kind of digitally transferable asset; any asset you can transfer by signing with a digital signature. They could even be used to hold fiat currencies, if governments decide that it is better to manufacture Firmcoins over banknotes because of counterfeit security, wear cost, public health, reduced cost of transport (since they can be turned online at any time), cost of acceptance (because it may be easier to check the authenticity of a Firmcoin over a banknote), etc. I think that in fifty years, if physical money still exists, then they will all be Firmcoins. I was pleased to discover that in the futuristic online game Shadowrun, there exists a physical device called a credstick that behaves in some ways very much like Firmcoins (see http://firmcoin.com/?p=66). Q. Would current Firmcoins require a significant modification to hold alternative types of data? SL: Generally no, but it depends on the cryptographic algorithms required to sign the other types of data. Bitcoin uses ECDSA for signatures, and that’s what we’ve implemented on the Firmcoin. Most cryptocurrencies are clones of bitcoin and so use the same signing scheme. If another cryptocurrency requires, for example, RSA signatures, then new firmware with RSA signing functions would be necessary to develop and program into the device. Nevertheless, if you take out the functions that require signing and key generation, you can actually use the Firmcoin to store any piece of private data you wish (provided you load the device only from a trusted third party). Q. Will a special smartphone app be needed to read and write to Firmcoins? – verify the authenticity of the firmware, and some other cool things. 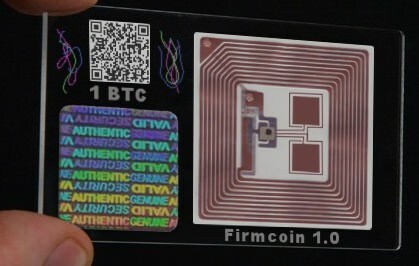 Q. Firmcoins communicate with the world via Near Field Communication (NFC). NFC is not standard in all smartphones. Most notably, the iPhone does not have NFC. How much of a problem do you see this as being for adoption of Firmcoin? SL: I’m not a futurologist, but I’m sure that NFC is here to stay. It’s just a matter of time until the iPhone will include an NFC reader. The most notable aspect of NFC technology is that NFC tags are passive (without batteries) and can be powered from the NFC reader, so they can be really cheap. A portable NFC reader with another communication interface to a smartphone costs so little that you can convert any smartphone in an NFC-enabled device. Q. Your blog says you’re going to Kickstarter for funding – is this your only source of funding? SL: Currently I’m being self-funded by my company Certimix. Next week I’m meeting investors, so Kickstarter is just an option we are considering. Q. Do you think having physical bitcoins will help mainstream adoption? SL: Physical (electronic) bitcoins are much more expensive than banknotes. A dollar bill costs approximately 5 cents to produce in a batch of 10 billion, where a Firmcoin could cost $4 (in 1K batches). So Firmcoins are not ready to replace bills in all context. Nevertheless, if one could manufacture Firmcoins in larger batches, the cost will go down, and also the cost of technology goes down very rapidly over time. The key for success of Firmcoins is that they are cheap enough to let people pay with them without thinking about the cost of the device. If you’re paying 1 BTC, then 0.03 BTC (the cost of a Firmcoin at 100 USD/BTC) is only 3% of the transaction cost, which can be regarded as the fee of an anonymous transaction and ignored. – Accept the same amount of empty Firmcoins in return of the payment. For example, if I pay you 100 BTC using 4 Firmcoins of 25 BTC each, you give me back 4 empty Firmcoins to cover the costs of the devices given to you. – Accept the same amount of a different (cheaper to manufacture) physical device that represents the cost of a Firmcoin. For example, you could receive one bitbill-like note for each Firmcoin given as payment. Or you could receive dollars for the cost of the Firmcoins. – If the payee has a smartphone connected to the Internet, he can give me back the cost of the Firmcoins used in the off-line transaction using a normal online transaction. Since the Firmware cost is low, the payer does not need to carry a smartphone to verify the transaction and may just trust the payee’s smartphone. So people should like the Firmcoins, but not too much they get attached to them! Q. When do you expect to ship Firmcoins to customers? SL: I have no idea. I started the project for fun, and I got a lot of interest immediately. I’ve been reached by investors without even asking for funds, and still only have a few prototypes to show. I suppose that with hard work and some capital I could start manufacturing in medium volumes in three months. I’m not in a hurry to go to the market. I want the Firmcoin to stand up against people’s expectations. I’ve applied for patents for some of the functions/methods and physical properties of the Firmcoin so I can have some time to do things well.